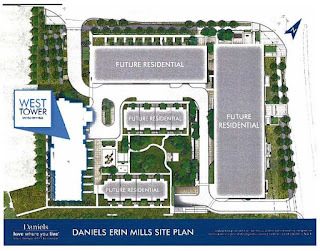 42 Story Condominium Tower to be built at Erin Mills and Eglinton by Daniels Erin Mills across from Credit Valley Hospital! 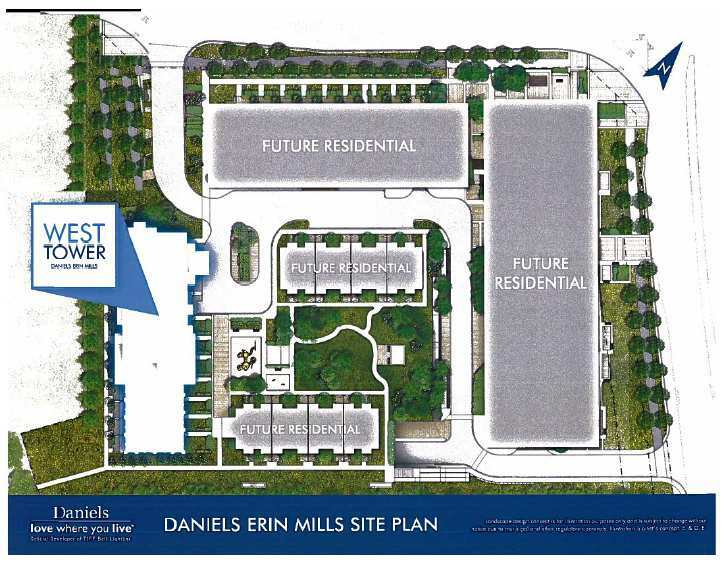 Daniels posted a giant sign at the corner of Erin Mills and Eglinton earlier this year, 2013, announcing Downtown Erin Mills condos! 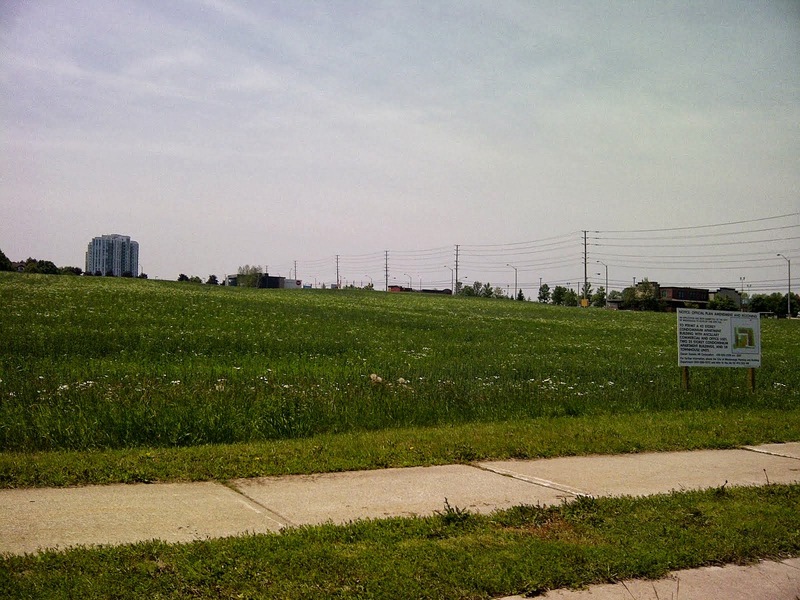 "Coming Soon"
Daniels has purchased the south west corner of Erin Mills and Eglinton just across from the Credit Valley Hospital a total of 6 acres. In the end, the site will have a total of 3 high rise towers, see the site plan below. The West Tower will be the first of the 3 towers to be built. The tallest of the 3 buildings will be 42 stories tall. For comparison purposed, the Park Mansion at 45 Kingsbridge Garden Circle is one of the tallest buildings in Mississauga north of the 403 at highway 10 and it's 38 stories tall, the condo building that they are planning on building at Erin Mills and Eglinton is 42 stories tall! 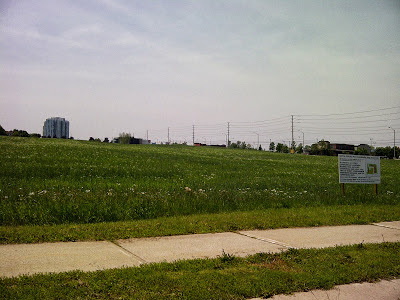 They are also building two sister buildings at Erin Mills and Eglinton two 25 story buildings! The Absolute buildings the last two towers (Absolute World 4 & 5) called the Twisted Sisters are the tallest buildings in Mississauga at 50 and 58 stories tall! I'll update you as more information comes becomes available! 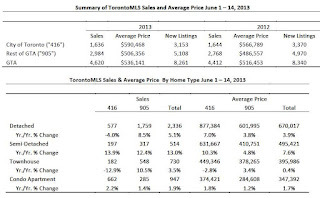 TORONTO, June 5, 2013 - Greater Toronto Area (GTA) REALTORS(r) reported 10,182 sales through the TorontoMLS system in May 2013, representing a dip of 3.4 per cent compared to May 2012. Sales of single-detached homes in the GTA were up by almost one per cent compared to the same period last year, including a three per cent year over- year increase in the City of Toronto. "The sales picture in the GTA has improved markedly over the past two months. While the number of transactions in April and May remained below last year's levels, the rate of decline has been much smaller. A growing number of households who put their decision to purchase on hold as a result of stricter lending guidelines are starting to become active again in the ownership market," said Toronto Real Estate Board President Ann Hannah. 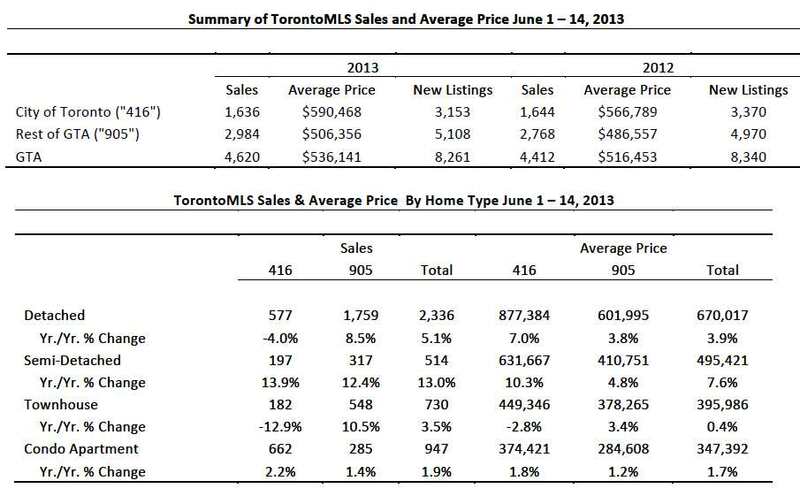 The average selling price for May 2013 sales was $542,174 - up by 5.4 per cent in comparison to $514,567 in May 2012. The annual rate of price growth was driven by the tight low-rise segment of the market and particularly by single-detached and semidetached home transactions in the City of Toronto. Average condominium apartment prices were also up slightly in comparison to last year. The MLS(r) Home Price Index (HPI) Composite Benchmark was up by 2.8 per cent yearover- year. "The annual rate of price growth in May was not surprising given the competition that still exists between buyers, particularly for low-rise home types such as single-detached and semi-detached houses. We remain on track for a three-and-a-half per cent increase in the average selling price for 2013 as a whole," said Jason Mercer, TREB's Senior Manager of Market Analysis. Greater Toronto REALTORS(r) are passionate about their work. They are governed by a strict Code of Ethics and share a state-of-the-art Multiple Listing Service. Over 36,000 TREB Members serve consumers in the Greater Toronto Area. The Toronto Real Estate Board is Canada's largest real estate board.